Audio compression allows you to limit the dynamic range of an input signal. If that went over your head, imagine the vast volume difference between a vocal singing softly versus really belting it out. Compression allows you to bring the two closer together by reducing the level of the loudest moments. Just like with other audio processing, never use compression just because it is available. Use it to solve a problem – otherwise, leave it alone. With that being said, I recommend using compression on every vocal channel. The average uncompressed vocal has a 40dB dynamic range. This is huge when it comes to live mixing and explains why you have such a hard time keeping vocals on top of the mix without getting to loud during the ‘belt it out’ moments. Attack sets the speed at which the compressor activates after the signal crosses the threshold. So, a slower attack time will allow the beginning of the signal pass through untouched before applying the compressor, whereas a fast attack time will apply the compressor almost immediately. Release sets the speed at which the compressor ‘lets go’ once the signal goes back under the threshold. A release time that is too short can produce a choppy or jittery sound, whereas a release time that is too long can result in a signal sounding ‘squashed’. 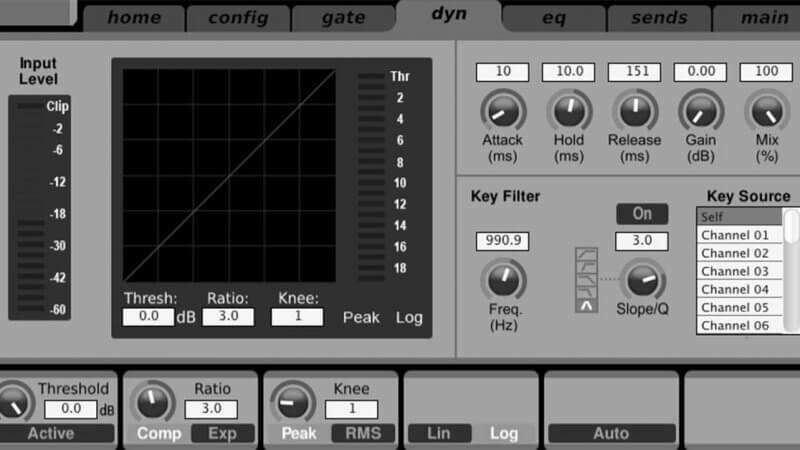 Gain allows you to restore the signal back to its original level before compression. So, if you are compressing the signal by 6dB, you can apply 6dB of gain to bring the signal back to where it was. In essence, this brings the uncompressed signals up by 6dB while leaving the compressed signal where it was to begin with. The threshold determines when the compressor kicks in. So, if a threshold is set to -30dB, the compressor will start working when the signal gets louder than -30dB. Ratio determines how much compression is applied. For example, if the ratio is set to 4:1, every 4dB of signal that crosses the threshold will be compressed down to 1dB. So, if the signal crossed the threshold by 8dB, only a 2dB increase would be heard. The knee setting determines how the compressor responds once the signal crosses the threshold. A hard knee clamps down right away, while a soft knee causes the compressor to gradually kick in as the signal gets further past the threshold. The key filter allows you to target a specific frequency range that activates the compressor. The compressor is still applied to the full frequency spectrum, but it is only activated by the frequency range set by the key filter. As mentioned earlier, a compressor reduces the level of the loudest moments. Well, an expander does the opposite – it reduces the level of the quietest moments. The expander is very similar to a gate. The only difference is that an expander pays attention to where the level is after it falls below the threshold and reduces the level accordingly, whereas a gate closes as soon as the signal goes below the threshold. When it comes to mixing for worship, I really can’t think of a time where expansion should be used over gating. So, the main thing you need to understand is that expansion is almost identical to gating, so you are better off using this section of the X32 for compression instead of expansion. I downloaded the sample compression settings. What knee should I be using? In general, a soft knee is the best option. If your setting allows you to set a number for the knee, the higher the number, the ‘softer’ it is. On your compression sample for vocals you have “Attack/Hold/Release: Auto'”. Can you explain the Auto part for a x32? Hey Manuel – On the X32, when you are on the compression setting screen, you’ll see one of the knobs labeled ‘auto’. If you push in this knob, it well set the attack/hold/release to auto, meaning the X32 will decide what these settings should be. Hey Kade, would you use this same setting for a pastors speaking mic, I’m always riding the fader when he’s preaching.